The Philips Pressure Cooker Inner Pot HD2778 is 6.0L capacity, and 304 Food grade stainless steel material inner pot. Why choose SJK for Philips Pressure Cooker Inner Pot HD2778 ? 1. Genuine replacement parts from Philips Malaysia. 2. SJK ensures safe delivery by protecting all goods purchased with bubble wrap and stretch film. 3. Express delivery, dispatch within the same or the next working day. 4. 100% brand new products, strictly not display unit. Philips Pressure Cooker Inner Pot HD2778 is 6.0L capacity inner pot, maximum convenient usage. 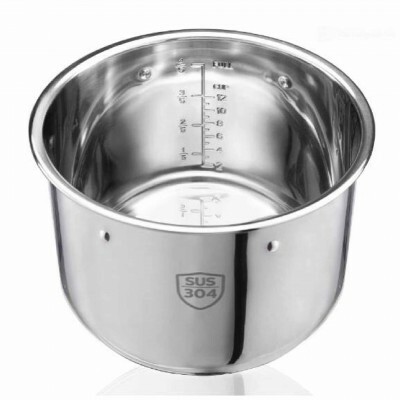 The high quality 304 food grade stainless steel inner pot material. The genuine replacement Inner pot for Philips Pressure cooker HD2139 and HD2137.